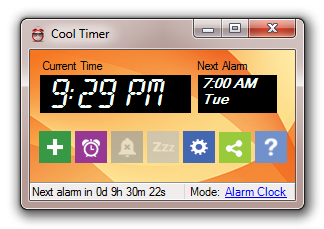 The Cool Timer is free alarm clock software that allows you to set up a countdown timer on your desktop down to the minute and second you want. It is an easy and cool way to keep track of your tasks and scheduling. Can be used in three different modes: countdown, alarm clock, or stopwatch. Optional graphical visualization of time passage in countdown mode. Optionally show cool, scrolling LED-style, customizable marquee message when alarm goes off. Several built-in sounds to use as an alarm. Use your own sound files for alarms (MP3 or Wav). Use Windows Media playlist files for alarms so that a different random song wakes you up or plays as the countdown alarm. Can be set for up to 1000 hours in countdown mode. Time digits can be shown full screen for easy viewing even from across the room. Save and reload preset countdown times. Set alarm in alarm clock mode for only certain days of the week. Optionally require that a simple, fun image puzzle be solved in order to be able to turn off alarm in alarm clock mode. Automatically wakes computer from hibernation before alarm sounds. Automatically unmutes system volum before alarm sounds. 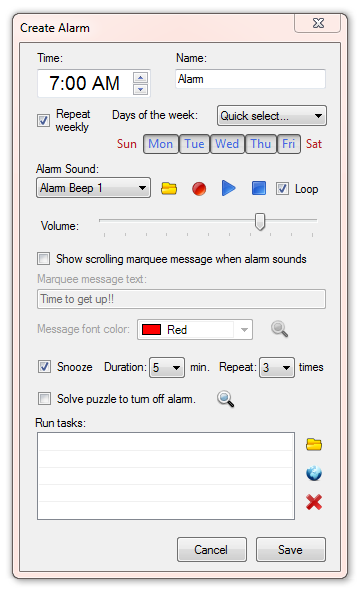 Automatically run a task on your computer when alarm sounds.